Welcome to DINNERCAKES – the blog that brings you fun and fresh recipes from oven to stove top, hosted by Edwin Bachetti and Heather (Ghost Baker)! It’s a beautiful fall day here in Arlington, Virginia, and I can’t think of a better way to kick off this blog than with something not only completely appropriate for the season, but also that contains my favorite ingredient – pumpkin! My co-host may try to fight it, but October is all about pumpkin. I’m convinced he just hasn’t experienced the right kind of pumpkin confection yet, and it’s my duty to change all that! Why do we, minus Edwin of course, love pumpkin? Is it the imagery it brings to mind – scrambling around the pumpkin patch with mom and dad looking for that perfect pumpkin to take home or the smell of dried leaves and their extraordinary palette of colors? Pumpkin alone isn’t exactly bland, but it’s not overpowering. It’s an excellent compliment to so many meals in the form of pumpkin ravioli, pumpkin enchiladas, or as a dessert. Pumpkin, done right, can take on so many forms. My brother and I are well-known in the family as being able to finish off a whole pumpkin pie at Thanksgiving by ourselves (I wish I was joking). My mouth waters every time I come across a new pumpkin recipe. 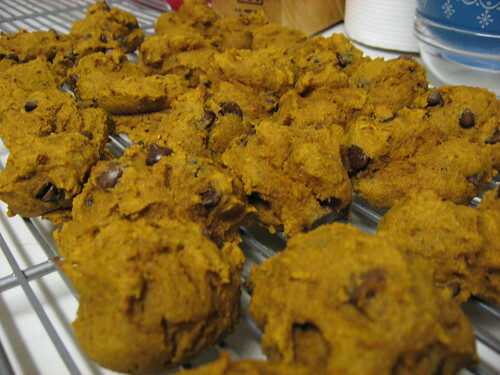 I was delighted when I came across a recipe for Pumpkin Chocolate Chip Cookies on Cookie Madness. I practically ran home from work to try this recipe. This Pumpkin Chocolate Chip Cookie recipe was, just as Cookie Madness writes, “super-cakey.” They came out almost like little muffins, except without the delicious muffin top. The overpowering flavor seemed to be the 2 cups of flour – it needs some zip! Instead of one cup of chocolate chips, try adding either an additional 1/2 cup or splitting the total amount with chocolate chips and butterscotch chips. Also, what is a pumpkin dessert without the pumpkin pie spice? 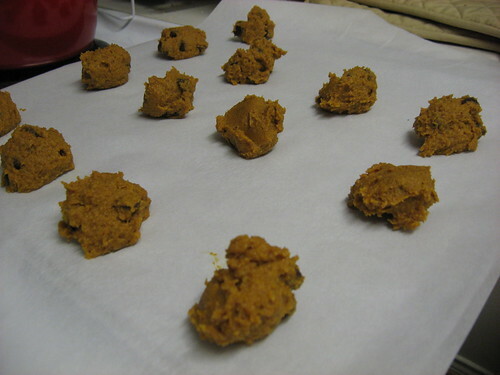 Spice these cookies up by adding 1/4 tsp of nutmeg, 1/4 tsp of cloves, and 1/4 tsp of allspice. The recipe without these suggestions is a great treat to bring to the office, I know my husband says his office scarfed them down, but if you really want to pack in some punch some additional spices and chips are a must! 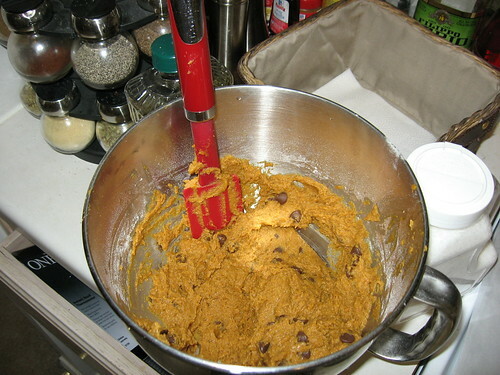 Beat pumpkin, egg, sugar, oil, vanilla, cinnamon, salt, baking soda and baking powder together in a mixing bowl. Fold in the flour and stir just until mixed. Stir in chocolate and butterscotch chips. Using a tablespoon measure or ice cream scoop, drop onto parchment lined cookie sheets 1-2 inches apart (don’t worry, they don’t spread). Bake at 375º for 13 to 15 minutes. Remove from tray and begin eating immediately! I’ve found these cookies are best while warm.